Private Clarence B. Craft was born in San Bernardino, California, and was a member of Company G. 382nd Regiment. He earned his Medal of Honor on May 31, 1945 in the battle for Hen Hill. Clarence B. 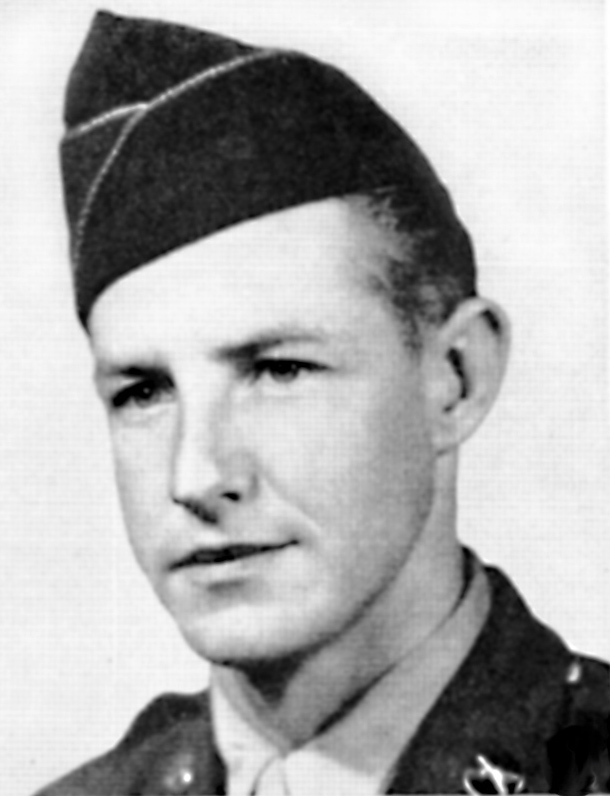 Craft was a rifleman when his platoon spear-headed an attack on Hen Hill, the tactical position on which the entire Naha-Shuri-Yonaburu line of Japanese defense on Okinawa, Ryukyu Islands, was hinged. For twelve days our forces had been stalled, and repeated, heavy assaults by one battalion and then another had been thrown back by the enemy with serious casualties. With five comrades, Pfc. Craft was dispatched in advance of Company G to feel out the enemy resistance. The group had proceeded only a short distance up the slope when rifle and machine gun fire, coupled with a terrific barrage of grenades, wounded three and pinned down the others. Against odds that appeared suicidal, Pfc. Craft launched a remarkable 1-man attack. He stood up in full view of the enemy and began shooting with deadly marksmanship wherever he saw a hostile movement. He steadily advanced up the hill, killing Japanese soldiers with rapid fire, driving others to cover in their strongly disposed trenches, unhesitatingly facing alone the strength that had previously beaten back attacks in battalion strength. He reached the crest of the hill, where he stood silhouetted against the sky while quickly throwing grenades at extremely short range into the enemy positions. His extraordinary assault lifted the pressure from his company for the moment, allowing members of his platoon to comply with his motions to advance and pass him more grenades. With a chain of his comrades supplying him while he stood atop the hill, he furiously hurled a total of two cases of grenades into a main trench and other positions on the reverse slope of Hen Hill, meanwhile directing the aim of his fellow soldiers who threw grenades from the slope below him. He left his position, where grenades from both sides were passing over his head and bursting on either slope, to attack the main enemy trench as confusion and panic seized the defenders. Straddling the excavation, he pumped rifle fire into the Japanese at pointblank range, killing many and causing the others to flee down the trench. Pursuing them, he came upon a heavy machine gun which was still creating havoc in the American ranks. With rifle fire and a grenade he wiped out this position. By this time the Japanese were in complete rout and American forces were swarming over the hill. Pfc. Craft continued down the central trench to the mouth of a cave where many of the enemy had taken cover. A satchel charge was brought to him, and he tossed it into the cave. It failed to explode. With great daring, the intrepid fighter retrieved the charge from the cave, relit the fuse and threw it back, sealing up the Japs in a tomb. In the local action, against tremendously superior forces heavily armed with rifles, machineguns, mortars, and grenades, Pfc. Craft killed at least twenty-five of the enemy; but his contribution to the campaign on Okinawa was of much more far-reaching consequence for Hen Hill was the key to the entire defense line, which rapidly crumbled after his utterly fearless and heroic attack. Mr Clarence Craft was presented the Medal of Honor at the White House by President Harry S. Truman. Mr Craft passed away on Friday, February 16, 2007, after leading a full honorable life, just as gallant as as he was on the day he earned this Medal of Honor. 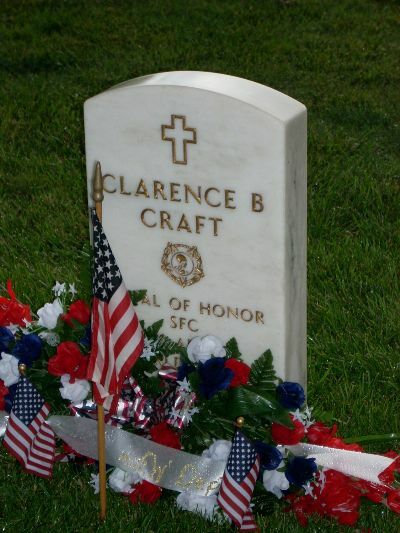 This YouTube video honors the service of Clarence Craft, Medal of Honor recipient. The narrative tells his story in the voice of Clarence Craft as if it was his own voice. 2002 Veterans' Day Celebration In Fayetteville, honored Craft at a Naming Ceremony by officially renaming the old post office the "Clarence Craft"